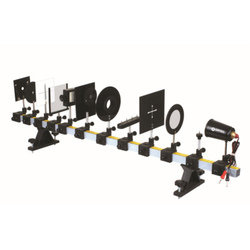 Our product range includes a wide range of bi prism assembly, inverse square law, two beam interference, lummer broadhome photometer, research optical bench and physics lab equipments. 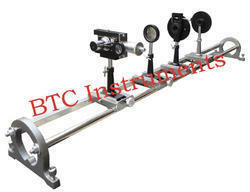 BTC Instruments Designed as an experimental unit for class room work in degree science laboratories, the biprism assembly is assembled from the following standardised components. d) One Adjustable Slit, True precision ground Stainless Steel jaws having spring action opening the jaws uniformly all along through a milled head. e) Biprism Holder, having fine radial motion by a fine pitch screw. Object:- To verify Inverse square law of light using a photo cell. Apparatus Required:- Optical bench, Photocell housed with Red and Black sockets, lamp house with lamps, DC Microammeter. Theory:-The Photoelectric emission may be regarded as a phenomena of liberation of an electron at the surface of a metal when a photon of light having energy above threshold energy (metal work function) incident on a metallic surface and transfer the enough energy to the electron to escape through the potential barrier layer. The photo cell can be considered as the generation of a voltage across a circuit element under illumination. Let P be the illuminating Power of a source so the intensity of illumination I due to it at a distance r would be I= P/r2 Since the photo electric current (θp) produced is directly proportional to the intensity of illumination ie. I α θp I=Kθp Where K is constant, hence I= P/r2 = Kθp. Since P and K are constant hence the relationship between 1/r2 and θp is straight line which verifies the inverse square law of radiation. Counted among the prominent manufacturers and suppliers, we are engaged in offering Two Beam Interference. 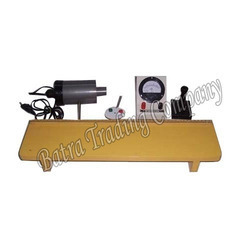 Used for carrying out various experiments, the offered interference is manufactured with the aid of modern machinery and technology. In addition, the offered interference is provided in different specifications to suit the demands of clients. 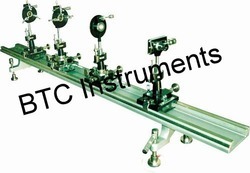 We are engaged in offering Research Optical Bench to our clients. Looking for Optical Bench Experiments ?